The Handtmann VF 630 is the universal industrial vacuum filler. 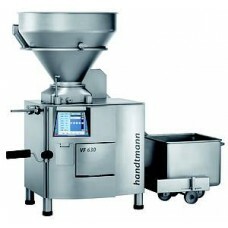 Its large vane cell feed system and hopper with 350-litre content ensure high production output. From the clipper to the Handtmann high-power AL system, the VF 630 vacuum filler always guarantees the best levels of output and product quality. The VF 630 vacuum filler demonstrates its universal application possibilities for industrial needs with low-viscosity liver sausage, traditional spreadable sausage, cooked sausage or other products.